What’s in a name? About $10 million. The 86-year-old Landmark Theater today officially becomes the Altria Theater. The Altria Group spent $10 million to secure the theater’s naming rights (see bottommost post) and fund the theater’s $50 million renovation project. Last night, Dominion Resources, Inc. announced that it will donate $2 million to fund ongoing renovations of the Landmark Theater, helping to subsidize the theater’s $50 million renovation project that began in July. The announcement was made outside of the 85-year-old theater before a Richmond Ballet performance of The Nutrcracker. As a result of the sizable donation, the Landmark’s stage will be renamed the Dominion Stage in late 2013. Among those present at last night’s announcement was Mayor Dwight Jones. Next year, the Landmark Theater will be named the Altria Theater after Altria paid $10 million to secure the theater’s naming rights. Those funds will also help finance the theater’s hefty renovation project (see post below). Tonight, The U.S. Army Chorus and The Richmond Pops Band will perform a free concert at 7:30 PM. Tickets for these and other shows can be purchased at the Landmark Box Office, CenterStage Box Office, online, or by calling 1.800.515.3849. Next year, the Landmark Theater will be renamed the Altria Theater (see post below). Renovations of the Landmark are expected to continue over the next two years. 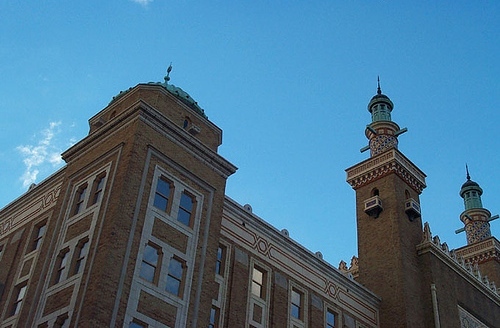 Beginning in 2013, the 85-year-old Landmark Theater will be renamed the Altria Theater. Today members of the Richmond CenterStage foundation, The Altria Group, and Mayor Dwight Jones announced that Altria had secured the theater’s naming rights for $10 million. “We are fortunate to have a partner like Altria, which understands the power of the arts and the impact they as corporate citizen can make on our community,” said Richard Parison, Jr., executive director of Richmond CenterStage. The theater will be formally named the Altria Theater when the first phase of the current $50 million renovation is completed in 2013. Altria will hold the naming rights of the historic theater for 20 years. There are 27 reader comments. Read them.